Some people live in the same town their whole lives. On their way to work, they pass the movie theatre where they had their first date. While waiting in traffic, they glance over at the football stadium bleachers they used to huddle under, smoking cigarettes and listening to the Violent Femmes. Maybe all those signposts serve as a reminder of how far one has come. Maybe they bring a smile of nostalgia. I mostly never lived anywhere longer than a year. Many of those anywheres were in Oklahoma. Go down by the river and grab a handful of small, smooth rocks. Throw them across the dirt path like you’re playing craps and see where they land. Those were the places I lived. I haven’t been back to any of them in 25 years. So as I drive by the movie theatre and the football stadium bleachers and walk down the stairs to the children’s room of the library, it’s like I’m remembering someone else’s life. My drive started in the middle. Driving south on I-35 from Kansas, you’ll be tempted to veer east towards Stillwater. Stillwater is a town some people have heard of, home to Oklahoma State University. Alma mater of Heisman trophy winner Barry Sanders and country singer Garth Brooks. You may have even seen an Eskimo Joe’s t-shirt or two in your travels around the world. I saw Sanders play at OSU’s stadium in 1988 – the greatest individual season in college football history. But I’m getting ahead of the story. As I said, I started in the middle. If you don’t veer east towards Stillwater, you end up in Perry (population 5,126), which is where I ended up after leaving the truck stop in Newton, Kansas. It’s also where I ended up in the middle of the fourth grade. What I remember most is the library. My memory holds this picture of a basement room, full of books. I would pile the books high in my arms, a book tower as tall as I could carry. And I’d come back the next week for the next stack, until I had read through them all. 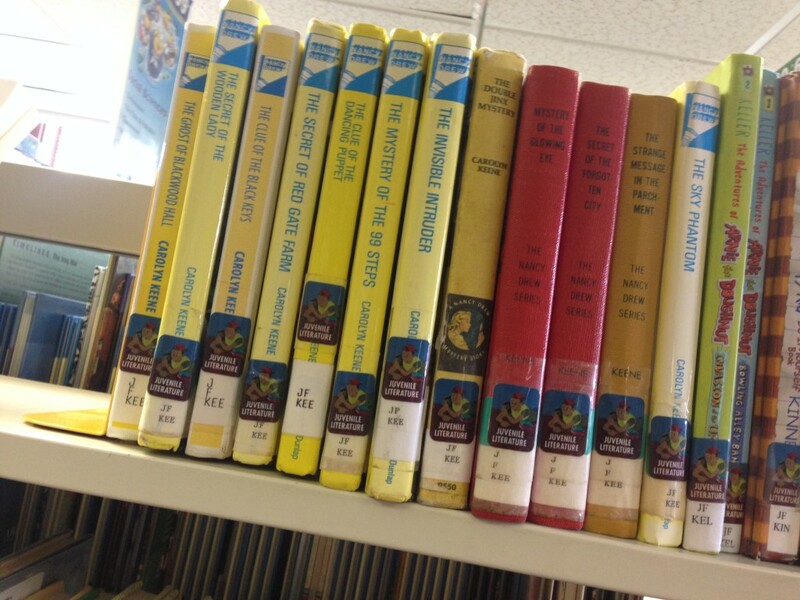 My favorite was Nancy Drew. I tried Hardy Boys when I had no more Nancy Drew to read but it just wasn’t the same. Was that room even real? Or has my mind constructed it over the years, a composite of libraries and schools and books in towns as scattered as stones? I walked in and saw the stairs. And went down into the basement room. Sure, it’s been remodeled, but it’s got those same basement windows, that same boxy shape. Still with nowhere near enough Nancy Drew mysteries. So maybe that’s what one feels when one sees signposts from years gone by: confirmation that one’s memories aren’t artificial constructs, but real life. The library (only open until noon on Saturday; wifi password is the phone number) isn’t all that Perry has to offer. Perry also has Timothy McVeigh. 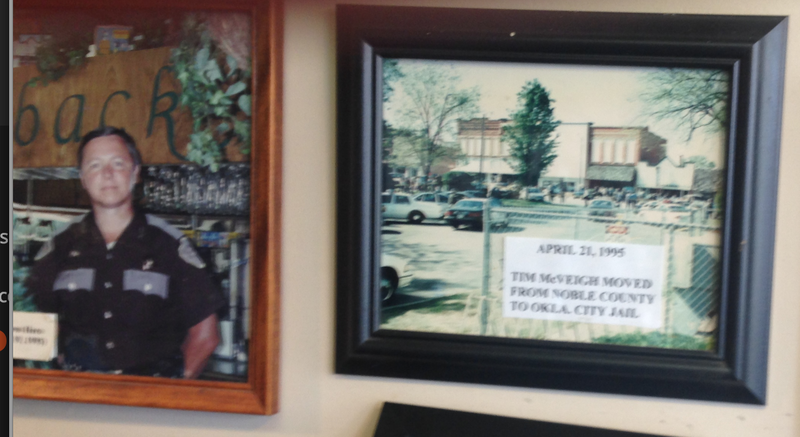 The photo on the left is the Oklahoma State trooper (standing in this very cafe) who arrested McVeigh. The photo on the right reads “Tim McVeigh moves from Noble County to Okla City jail”. (The chummy “Tim” as though he and Perry were friends; they were not. He simply had to drive past Perry (where he was stopped) on his way from Oklahoma City, an hour to the south). Anyway, all of that was after my time. I left Perry in 1983. Here’s what I found in Perry: once the library closed at noon, no place in town had wifi. My RV app claimed there was a state campground nearby, but it was nowhere to be found. There were no coffee shops. The town square gathered together buildings that had once held stores, but now held nothing. I had lunch at the diner and kept driving.